Read all about the coming transit of Mercury below. And remember: NEVER look directly at the sun without proper protection. Serious and permanent eye damage can result. Today's Mercury transit will last nearly 7.5 hours. See the major stages of the celestial event here. Get a satellite's-eye view of what the Mercury transit of May 9, 2016 will look like. If bad weather spoils your view of the Mercury transit of 2016, don't fret. You have many ways to watch it live online. See how in our full webcast guide here. Patricia Totten Espenak, a veteran eclipse chaser and author, gives us a glimpse at what seeing a transit of Mercury is like for skywatchers and astronomers alike. The transit of Mercury is more than just a shadow on the sun. See the big science packed in the tiny planet's trip across the face of the sun. Take a trip back in time to learn the history of Mercury transit observations in our special column Space.com's skywatching expert Joe Rao. Astronomers and skywatchers on Earth aren't the only ones to watch the transit of Mercury across the face of the sun on May 9. See how NASA satellites will track the rare celestial event. Mercury Transit of the Sun: Why Is It So Rare? Space.com's Mike Wall takes a look at just why transits of Mercury only occur 13 times per century. Eclipse glasses aren't enough to see the Mercury Transit of 2016. See what safety gear you need to properly observe the Mercury transit of May 9. Here's a brief explainer of Mercury transit of the sun on May 9, 2016. Skywatchers across most of the Earth have a chance to see the Mercury transit of 2016. Here's a look at the visibility maps and timing of the event. Wow! Mercury is an awesome planet. Check out these new maps of Mercury made from data collected by NASA's MESSENGER spacecraft. Starry Night Software's own Geoff Gaherty gives us an idea of how to see the Mercury transit of 2016, and what to expect. 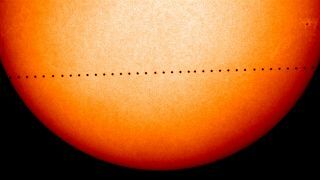 On Monday (May 9), you will have an opportunity to witness one of the rarest astronomical events: a transit of Mercury across the face of the sun. Here's what to expect. While scientists are used to seeing sunspots and solar flares crossing the sun's surface, a different kind of spot will pass through on Monday: the dark shadow of Mercury, which will travel between the sun and Earth that morning. A new video from NASA sets out what you need to know about the rare celestial event. This month, look skyward to see Mercury transit across the disc of the sun and witness Mars make its closest approach to Earth since 2005. Observe a rare celestial treat when Mercury transits across the face of the sun on Monday, May 9. Check here to find out if this celestial event will be visible in your area, and how to see it online. For the next two weeks, we will have our best view of Mercury for 2016. For observers in the Northern Hemisphere, Mercury is at its best in April and May in the evening sky, and October and November in the morning sky. Start preparing now for one of the major astronomical events of 2016: On May 9, Mercury will pass across the face of the sun.